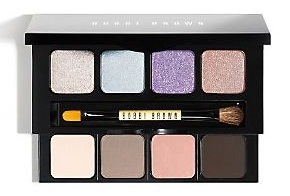 I found Bobbi Brown's Pastel Shadow Option Palette ($60) at my favorite bargain makeup hunting grounds in Leesburg, Virginia. That Estée Lauder Company Store is one of my favorites. This palette is filled with pretty neutrals for the eyes and shimmering pastels for night - subtle polish for day and a bit of drama for night. It caught my eye! The top row is filled with four beautifully shimmering, playful pastels. 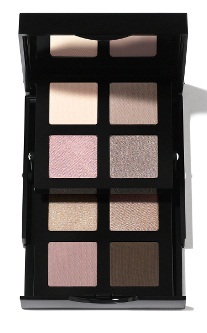 The bottom row has an allover shade, two wearable neutrals, and a liner color that can be layered for a smoky look. Bobbi Brown had directions for how to use the shades, but you don't need them. This palette gives you options to experiment. Here are the shades and the brush that are contained within this pretty palette. The deadline for entries will be tomorrow, Saturday, April 6, 2013, at midnight. The next morning, I will use a random number generator (random.org) to select the winner. I will e-mail the winner on Sunday morning. The winner will have 48 hours to reply to my message and provide a shipping address. After 48 hours, the prize will be forfeited, and another winner will be selected. Make sure to check your e-mail - and look in your spam folder - when the contest ends. The collection we've been anticipating is here! I took at photo at Saks Fifth Avenue in Chevy Chase, Maryland, of four of the five new Collection Révélation Lèvres Scintillantes Glossimers ($29.50). Ocean Shimmer is the one I didn't swatch - primarily because it's clear. These are the shades that Chanel has introduced as new. 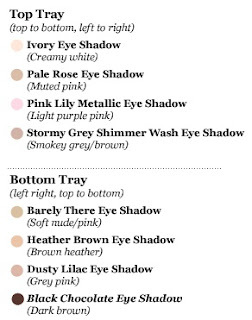 The other shades in the collection are repromotes (see below). Inspired by the elegance of Gabrielle Chanel, Collection Révélation makes lip gloss the essential accessory for summer. A fresh palette of best-sellling Lèvres Scintillantes Glossimers ($29.50) presents captivating options. New and beloved shades offer a sophisticated spectrum of color, from simply sheer Ocean Shimmer to intense yet versatile Crushed Cherry. An array of finishes - subtle sheen to sparkly metallic - complements every look with ease. The colors in Collection Révélation are listed below. My photo above, shows, from left to right, #172, Rose Sauvage; #174, Daydream; #175, Savage Grace; and #176, Crushed Cherry. That's also the order in which I swatched them on my arm, shown with #172 at the top and moving down numerically. I took my swatch photos at high noon outside of Saks. Had I had the money, I would have purchased all four of them. I gave myself a day to think about it, and I still can't decide. I plan to limit myself to two. The problem is that they are all gorgeous. Rose Sauvage at the top of my arm is described as a light rosewood, but I see more of a medium pink. I don't see any brown in it. It is the sheerest of the four. I think it's very pretty, but not necessarily unique in my collection. Daydream (second down) is gorgeous. I really don't know why Chanel described it as an intense metallic fushsia. Metallic/shimmering? Yes. Fuschsia? No, I would reserve that description for Savage Grace. That leaves me wondering if I confused the descriptions from the training sheets, so I went back and checked. No matter what shade Chanel calls it, I would call it a shimmering, warm pink - one of the prettiest shades I've seen lately. I'm sure this is one of the two I will purchase. Savage Grace (odd name for a lip gloss, don't you think?) is a wow shade. Bright, shimmering fushsia, it could also be a rose-red on the lips, depending on lip coloring. It's a beauty. Crushed Cherry, described as a deep burgundy, is more of a cherry red to my eye. It's so pigmented that wearing it is like wearing lipstick, not gloss. A bit less shimmering than the others, it's a perfect red gloss for those who are comfy with red lips. Ocean Shimmer is a clear shimmer that adds iridescence to the lips without color. It's a great topper, but I don't think I need it. Which shades look like must-have's to you? Chanel's Collection Révélation Lèvres Scintillantes Glossimer for Spring/Summer 2013 is available now. You can see the collection at Chanel's Web site, and I'm sure it will arrive at your favorite Chanel counter soon. If you would like help from the Saks Chevy Chase team, give them at call at (240) 497-5363 or (240) 497-5301. Georgia and Maria will be happy to help you. I hear Loyd has been feeling under the weather. Whether it's a holy day for you or an opportunity to celebrate a holiday with friends and family, I hope you enjoy your day. Yesterday, the Easter Bunny gave me a gift: three bottles of amazing perfume. 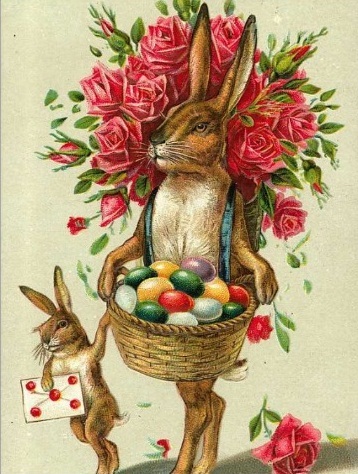 That bunny collects Victorian perfume bottles, not perfume. When I told her I liked to collect perfume, she gave them to me. She made my weekend! I will be eating Easter dinner at my mother's today - her favorite Easter meal, of course. We will have ham with all the usual sides. Think I'll break out a nice bottle of champagne to celebrate spring and the rebirth of nature's beauty. I could "feel" spring yesterday. Chanel Collection Révélation Lèvres Scintillantes Glossimer for Spring/Summer 2013 Has Arrived! Not long after I returned from Saks Chevy Chase today - with swatch photos - I got an e-mail from Chanel that showing the availability of the Collection Révélation, a fresh palette of Lèvres Scintillantes Glossimers ($29.50). I took swatch photos of all the new, limited-edition shades, with the exception of the clear Ocean Shimmer. I will post the swatches either tonight or tomorrow - as soon as I have time - so stop back before you order. Hint: they are pigmented and pretty. This contest has ended. Congratulations to our winner, Erin! 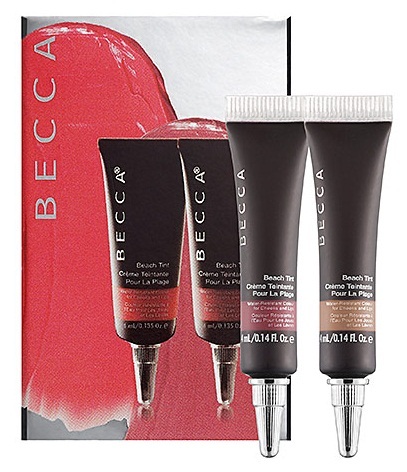 Becca's Beach Tint Duo ($16) is a set of two-in-one cream stains for cheeks and lips. I have one set of these little wonders to give away. I decided the set should be one reader's Easter present. Stain your lips and cheeks with a natural wash of color. Becca’s bestselling beach tints, Watermelon (bright pink) and Fig (tea rose), are beautifully blendable creams enriched with antioxidant vitamin E. Water-resistant and subtly scented according to each fruity shade, they are perfect for a day at the beach - or a day that just feels like one. Dermatologically tested, these award-winning editor favorites dry to a streak-free, natural finish. The deadline for entries will be Sunday, March 31, at 5:00 pm EDT. I will use a random number generator (random.org) to select the winners. I will e-mail the winners on Sunday afternoon. The winners will have 48 hours to reply to my message and provide a shipping address. After 48 hours, the prize will be forfeited, and another winner will be selected. Make sure to check your e-mail - and look in your spam folder - when the contest ends. This contest is open to anyone anywhere. Here are the terms. If the sample is lost or stolen in transit, I may not be able to replace it. I'll be sending the samples to the winners in padded envelopes. This summer, make a splash with Tarte’s limited-edition shade of Glamazon Pure Performance 12-hour Lipstick in Timeless ($26), inspired by America’s most glamorous water ballet group, the Aqualillies. This long-wearing Amazonian clay infused lipstick nourishes and balances lip moisture as it delivers a pure splash of color in the Aqualillies' signature lip shade: vibrant coral. Mine was sent to me gratis by Tarte. Now I need to plan a trip to the beach. A unique blend of emollient-rich butters (mango, avocado, and shea) is encapsulated in this proprietary natural formula to achieve a rich, bold statement lip that lasts for 12 hours, applies smoothly, and won’t fade away. Always hydrating and never drying, this high-cushion lipstick keeps lips moisturized all day long, minimizes the appearance of fine lines, and stops feathering in its tracks to give lips a perfect, plumped-up appearance. The long-wear Glamazon Pure Performance 12-hour Lipsticks are stylishly and consciously enclosed in a sustainably harvested bamboo bullet case to keep moisturizing properties on lock-down. Thanks to the natural power of Amazonian clay, this fade-free color stays in place all day so there’s no need to continuously reapply or worry about smudging and budging. Amazonian clay also restores the lips’ natural moisture content with nourishing and hydrating properties to not only adorn lips but to treat them to skin wellness. All of the Aqualillies Collection items come in the themed packaging, characterized by coral and turquoise. I love the look! The same design - evocative of bodies in harmonized motion - is carried into the wooden cap of the lipstick tube for a beautiful presentation. The base of Timeless reminds you that its your Aqualillies Collection lipstick. Now look at the glorious color. I took my swatch photos in full, afternoon sun. Timeless is bright, opaque coral. It's an impressive color. It also has amazing lasting power. If you want a lipstick that will look sunny and take you to a day at the pool or the beach, Tarte's Timeless fills the bill. It's a perfect shade for a team that performs in the water. I took many swatch photos, and it was easy to select two. There wasn't a bad shot of Timeless. You can find this fabulous collection (make sure to look at the eye and cheek palette) at Tarte's Web site, where shipping is free with a $40 purchase. 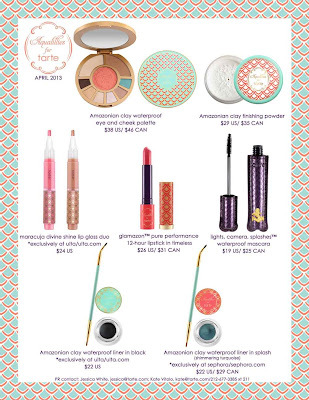 The collection will be available at all of Tarte's retailers in April. All over the United States and Europe, people are wondering what happened to spring. After a mild winter in the DC area, suddenly it's cold, cloudy, and even snowy. Fortunately, the snow hasn't amounted to much here. Event when I had four inches in my back yard, my little street was only lightly covered in shaded spots. 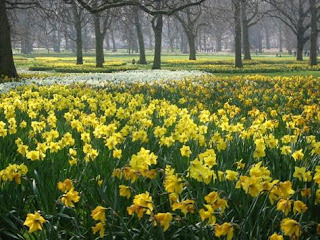 Still, the early daffodils persist. They are hardy souls - like the other early spring bulbs. This has been a very slow beauty week for me. I haven't visited any stores, primarily because we are in an introduction lull. The summer collections will arrive at counters any day. April will be a busy month. I've taken the opportunity to rest my foot and try to make some sense of the clutter that has built up since it started hurting. I try to sort my mail at the recycling bin when it arrives - even before it makes its way into my house, but I'm not always successful. Who wants to stand outside and sort mail when it's raining? It's Good Friday, and I know many of you are preparing for Easter Sunday. Passover had begun. Many schoolchildren are on spring break. This is a busy time; I can see it in my blog's visit statistics. I'll try to come up with some irresistible things to show you over the weekend. One thing that caught my eye - perhaps because of the Easter egg colors - was an advertisement for new Stila colors. The two eyeliners, while not terrible practical, look beautiful. 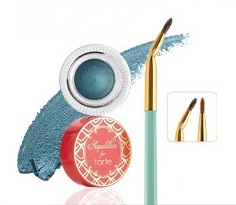 Periwinkle and Turquoise Smudge Sticks are perfect shades for spring. They were inspired by water and sky - and maybe a few Easter eggs. Don't forget to enter this week's giveaway contest for Tarte's five-piece LipSurgence set. The deadline is tomorrow, Saturday, March 30 at midnight. I'm thinking of running an additional flash giveaway over the weekend, so make sure to check back. Months ago, HydroPeptide sent me HydroPeptide Eye Anti-Wrinkle Dark Circle Concentrate ($60) to test. It took awhile for me to start using it because I only test one eye treatment at a time. How else would I know what's doing what? I've been using HydroPeptide for about six weeks (maybe seven), and I think it's a great eye treatment. I have to agree with the marketing information below. The lightweight, yet super-hydrating eye cream is marketed as an under-eye cream, but I have been using it over and under, with no seepage into my eyes and no ill effects. I'm incorrigible. Combat all the eye area concerns from fine lines and wrinkles to dark circles and puffiness. HydroPeptide Eye does it all and does it effectively. Seven peptides go to work visibly lifting wrinkles, reducing puffiness and dark circles. Immediately, pearls add a pretty luminescent glow, and hyaluronic acid perfectly hydrates. Perfectly primes eyelids for eye makeup for smooth, crease-free application. I don't suffer with dark circles, but HydroPeptide Eye has captured me anyhow. They say you don't have to have dark circles to appreciate what a tiny dab will do for you. How does it do that? With its all-star line-up of ingredients. Look at the ingredient list, and you will see several peptides, botanicals, and (gasp) even retinol palmitate. I am terribly sensitive/allergic to retinol, yet this eye cream never caused burning, peeling, or discomfort. There's Vitamin K (known to help prevent capillary leakage under the eyes) and licorice, great ingredients for combating dark circles; sodium hyaluronate, nature's sponge - a fabulous moisturizer; and arbutin, a bearberry-derived natural skin brightener. I won't give you the science on all of the ingredients. I know there's a point at which your eyes may glaze over. At HydroPeptide, the focus is on peptides. They are leaders in peptide technology and currently incorporate 21 of the latest generation peptides in their HydroPeptide Collection. This number is always growing as they test new peptides. They claim to have created the most advanced and comprehensive peptide collection available to lead the way in innovation and peptide technology. This eye cream contains dipeptide-2. That's a peptide with a structure resembling that of the lipid content of the epidermis. It's considered to be a Natural Moisturizing Factor (NMF). As an NMF, it helps keep the intercellular structure of the epidermis intact, facilitates the skin’s healing process, prevents dermal irritation, and may even regenerate the skin. That's only one of the beneficial peptides in HydroPeptide's products. HydroPeptide products are also paraben-free, phthalate-free, and cruelty-free. That leaves me extra-friendly toward the company. 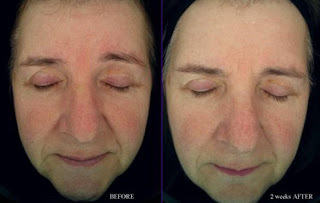 Here are photos of a test subject after two weeks of using HydroPeptide's Sensitive Skin + Redness Relief Collection, including HydroPeptide Eye. Two weeks! All I can say is, "Wow!" You know what I really like about this photo? Have you ever noticed how staged before and after photos are? In the before photo, the subject is always frowning. Before photos look a bit like mugshots. In the after photo, the subjects are smiling - all happy, presumably, with the results. There's nothing like a smile, but it does nothing to illustrate most skin care results. What specific results have I seen? First, it takes only a teeny tiny bit to apply under the eyes and over the eyelid crease. I'm sure that's why the half-ounce container has lasted me for a long time. When you pump the product onto your hand or finger to apply it, you will notice a pearly look. That pearly appearance transfers to the skin around my eyes, brightening for a radiant look. Could it be that pearl powder and mica in the ingredients? I think so because they really add a luminescence that's impressive. It feels cool on the skin and absorbs quickly, leaving the perfect base for my makeup. I nave noticed no fragrance - one of my pet peeves with skin care. My expression lines have been minimized, and the crepiness on the inside over the crease has been way less noticeable. The area around my eyes looks fresh and healthy after six weeks of continuous use (morning and night before bed). Perhaps it's turning back the hands of time? I think so. I'm a believer. I got so excited about it, I started applying it to the nasolabial folds around my mouth. One more thing - for now. HydroPeptide is a company with a social conscious and a heart. See this page for a list of their philanthropic donations and their care for the environment and wellness. Just one example? HydroPeptide believes strongly in supporting those in need when help is needed most. HydroPeptide pays 11% of their profits to help support various charities that aid humanitarian projects worldwide. My kind of company! What more can I tell you? You can find HydroPeptide at their Web site. I've seen the eye cream at Amazon for $51.44 and drugstore.com at list price. I will definitely purchase it when my gratis container pumps its last pump. Everything about Tarte's new Aqualillies Collection for Summer 2013 has captured my fancy - from the design of the products to their color - and the promotional theme and shots. You can see it all at Tarte's Web site. Yesterday, I received the Amazonian Clay Waterproof Liner in Splash ($24) and did a little happy dance (the liner was sent gratis by Tarte). I love this collection, and Splash was "on my list." The Aqualillies Collection was inspired by the Aqualillies, America's hottest water ballet entertainment company. You can learn more about them at their own Web site. While they don't compete as synchronized swimmers, as I had originally thought, they do take their performances on the road, mesmerizing audiences with their modern strength and vintage beauty. These true Tartelettes, fearlessly powerful, healthy, real women, are the perfect muses for this high-performance, splash-proof Tarte collaboration. Maureen Kelly, founder and CEO of tarte, first spotted the Aqualillies during their high-energy performance on an episode of Glee (I remember that!). In that instant, she knew Tarte, with its high-performance natural ingredients and powerful formulas, had to partner with these gorgeous athletes. Splash, a limited-edition version of tarte’s signature Amazonian Clay Waterproof Liner will stay on your eyes when you take a dip in the water. Guaranteed! I swatched it yesterday, and it was still on my arm this morning - after washing it off with soap and water. I'll take the heavy-duty remover to it soon, but I've enjoyed looking at it. Splash offers a glamorous poolside, waterproof eye look with a dreamy teal color in a cream liner that will hold up against rain, sweat, tears - and even swimming! It comes with its own dual-ended liner brush. The custom-designed angle of the limited-edition, double-ended bamboo liner brush allows for the most precise line possible for a sleek or bold splash of color. Whether you’re captivating audiences with a poolside performance, or powering through your busy day, the unique fusion of technologies results in an intense, yet smooth and plush cream teal line that will stay in place and last in the water as long as you do. I was losing my light yesterday when I took these swatch photos. That seems to be the story of my photography this week. The product photos above a just a tad dark. I used Tarte's fancy liner brush and drew a T, which seemed perfectly appropriate. It was cold and windy, but Splash brightened my mood with its shimmering aqua color. It made me think of summer. You have to admit: this color is magnificent. Not only is it a perfect shade for a poolside theme, it's a color that will make your eyes pop, no matter what their color. The combination of the shimmer that glistens in the sunlight and the color is stunning. I am thrilled to have Splash. I can't wait to wear it outside the house. Application is a piece of cake using the liner brush that comes with it. I can easily apply the thin line I love. I think Tarte has a hit on its hands for summer with the entire collection. In concert with the Aqualillies Collection - and because the design is so pretty - Tarte is offering beautiful coordinating accessories (in very limited quantities) with online Aqualillies Collection purchases. 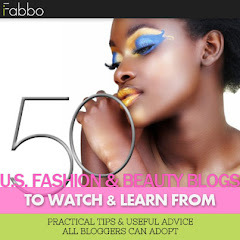 Make sure to check out the makeup bag, tote, and shower cap at this link. I'm going off to place an order before they sell out, which should be very quickly. I want that tote! I'd love the have the makeup bag too, but I can't order that much. I don't often watch Dateline. I'm not a serial show watcher, and after the news, I usually turn the television off. Sunday night, I was tired and wanted to do as little as possible, so when the NBC News rolled into Dateline, I watched. Did I get an education! Unfortunately, it relates to personal care and beauty products. NBC Correspondent Andrea Canning embarked on a study of her everyday products to better understand her exposure to the chemicals BPA (Bisphenol A), triclosan, and phthalates – also considered hormone disruptors. Hormone disruptors, chemicals found in the products we use every day, can cause depression, anxiety, and, honestly, who knows what else. The FDA has concluded that these chemicals are safe in the recommended amounts. The scientific community isn't as sure. Hormone disruptors interfere with the endocrine (or hormone system) in animals, including humans. These disruptions can cause cancerous tumors, birth defects, and other developmental disorders. Any system in the body controlled by hormones can be derailed by hormone disruptors. Specifically, they are known to cause learning disabilities; severe attention deficit disorder; cognitive and brain development problems; deformations of the body (including limbs); breast, prostate, thyroid, and other cancers; and sexual development problems, such as feminizing of males or masculine effects on females. Andrea Canning decided to have herself and her children, one a six-month infant and one a toddler, tested for these chemicals. Urine tests show these chemicals as they are excreted from the body. The results were astounding - so astounding that I went out the next day and bought new toothpaste. More on that below. Before I tell you about Andrea's tests, I'll give you a brief intro to these very different chemicals. Bear with me; this is going to be long. Much of my information came from quick Wikipedia searches. I have not had time since Sunday to start reading the journal articles. BPA is is used to make certain plastics and epoxy resins. It has been in commercial use since 1957 and around eight billion pounds of BPA are used by manufacturers every year. BPA-based plastic is clear and tough and is used to make a variety of common consumer goods (such as baby and water bottles, sports equipment, and CDs and DVDs). It's used for industrial purposes, like lining water pipes. Epoxy resins containing BPA are used as coatings on the inside of many food and beverage cans (apparently like my V-8 cans). It is also used in making thermal paper such as that used in sales receipts. It's "everywhere." BPA exhibits hormone-like properties that have raised concern about its suitability in consumer products and food containers. Since 2008, several governments have questioned its safety, which has prompted some retailers to withdraw polycarbonate products. A 2010 report from the FDA warned of possible hazards to fetuses, infants, and young children. In September 2010, Canada became the first country to declare BPA a toxic substance. The European Union, Canada, and recently the United States have banned BPA use in baby bottles. For the adults? They seem to have no concerns. Triclosan is another story. It is an antibacterial and antifungal agent. Though many products contain triclosan, there is no evidence, according to the FDA, that triclosan provides an extra benefit to health beyond its anti-gingivitis effect in toothpaste. However, studies by the EPA found triclosan to be an effective antibacterial. Triclosan safety is currently under review by the FDA and Health Canada. I had heard a long time ago that the use of antibiotic ingredients in consumer products, like liquid hand soaps and sanitizers, were diminishing our natural resistance to bacteria. Some studies have shown Triclosan to be a hormone disruptor. I had never used these antibacterial products and started actively avoiding them when I learned of the questions about their use. Phthalates are mainly used as plasticizers (substances added to plastics to increase their flexibility, transparency, durability, and longevity). They are used primarily to soften polyvinyl chloride (PVC). Phthalates are being phased out of many products in the United States, Canada, and the European Union over health concerns. Phthalates are used in a large variety of products, including fragrances, adhesives and glues, electronics, agricultural adjuvants, building materials, personal-care products, medical devices, detergents and surfactants, packaging, children's toys, modeling clay, waxes, paints, printing inks and coatings, pharmaceuticals, food products, and textiles. Start looking, and you will find them everywhere. Women may be at higher risk for potential adverse health effects of phthalates due to increased cosmetic use and the fact that phthalates are ubiquitous in beauty products. There is some evidence that there is an association between phthalate exposure and endocrine disruption, leading to the development of breast cancer. Want that in your makeup? Andrea had herself and her children baseline-tested, before she made any changes to the products she used. Their baseline numbers were around the national average (which is pretty high). Then she tried to eliminate these chemicals by changing her family's diet and the products they use. She looked for fresh fruits and veggies (not canned), used unscented cosmetics, avoided antibacterial soap, and avoided plastic with the #7 recycling symbol (here is a fact sheet on plastics). She found triclosan in her Colgate Total toothpaste (I gasped; that's what I used to use before Monday), and she switched toothpaste. When she was tested again after eliminating potential sources of hormone disruptors, her levels fell to almost zero. A relatively easy success! To test the test, the day after getting the zero-level test results, she tried to boost her numbers again by doing the normal everyday things she would have done before. She microwaved her oatmeal in a plastic cup, had canned soup and vegetables for lunch and dinner, put on makeup with fragrance, drank a V-8 and a diet Coke that came in cans, washed her hands with Dial soap, and brushed her teeth with Colgate Total. The result? Her numbers spiked immediately. Clearly, she was ingesting the hormone disruptors in these products. The chemicals from containers were leaking into her food. She was ingesting her toothpaste and beauty products. She also tested her children. Their levels were also high - even though the FDA considers them "normal." I don't like the idea of ingesting chemicals that may have harmful effects on my body. While I cannot give up perfume, I can avoid products that contain synthetic fragrances. I will have to start buying my beloved V-8 in glass containers - if I can even find glass. I don't eat canned food, but my mother does. From now on, only frozen veggies for her. I've already thrown out my Colgate Total. I found it contained not only triclosan, but also propylene glycol. For now, I'm testing Crest 3D Optic White. It contains no triclosan. I have always been label-conscious, but now I'll be especially vigilant. You can see the episode I saw at this NBC link. It's worth a watch. Somewhere along the way, I purchased a trio of Tarte LipSurgence Lip Tints. I decided that today would be a good time to show them to you since a set of five is this week's giveaway contest. Tarte LipSurgence Lip Tint ($24) is a hybrid between a stain, a gloss, and a rich balm. LipSurgence Lip Tint delivers nondrying, sheer color while keeping the lips hydrated and refreshed. This award-winning tint is goof-proof - it goes on like a lip gloss, stays on like a stain, and hydrates like a dreamy balm. The proprietary formula effectively increases the skin’s water content for a plumped appearance and a refreshing hint of mint. The result? Naturally fuller, rich lips without any irritation or stinging. The easy-to-use twist-up container eliminates the need for sharpeners. There was a momentary break in today's cloud cover, and I was ready. The Lip Tints were in my pocket, and my only challenge was to keep the tubes from blowing around in the wind. Success! The photo above shows Charmed, Enchanted, and Joy from left to right. I was able to snap a few swatch photos before the clouds ruined my sun spots. I applied the lip tints straight from their handy, colored tubes. Charmed is shown at the top or my arm. It's a pretty pink with enough color to show on my lips. The rose Enchanted is my favorite. It's one of those "my lips but better" shades. Joy is orange. Tarte calls it peach. Normally, it wouldn't catch my eye, but today I tried applying it over Enchanted, and the result was a color better than either of them alone! Joy deepens the rose, adding a touch of warmth. I had one of those "wow" moments! These lovely LipSurgence Lip Tints feel great on my lips. The hydrating feel lasts. It's not a momentary flash - what I find with some lip colors marketed as hydrating. The minty taste is light and goes away quickly. That's why I'm OK with it, even though I'm not fond of flavor in my lip products. As I'm sure you know, Tarte products are cruelty-free and contain no nasty stuff to ingest. I think my next purchase will be Moody, a deep berry shade. You can find Tarte's LipSurgence Lip Tints at Tarte, Sephora, and Ulta. Each retailer seems to have a different set of shades. These three are available at Tarte, although I don't see the trio special anymore. Remember that little star magnolia bud I showed you last week? It's still struggling to open, but the snow and cold weather have keep it safely protected. Nature will not be denied, and I noticed today that it's starting to open. I snapped a photo under cloud cover. It closes this feature below. Why? Because makeup reminds me of nature's beauty. Cristophe Professional sent me their Hydrating Shampoo and Conditioner ($8.99 each) to try in advance of their rollout to new retailers. Now that I've use them entirely, I'm ready to tell you about them. I can't get another drop out of the containers. Think I liked them? They are shown above in a photo of a value set, the Practical Suite: Hydrating Platform, however, you can purchase them separately. When your skin is thirsty and dry, so is your hair. That would be all of the time in my case. As your skin cracks (my heels were a mess this winter), your hair cuticle becomes jagged, causing your hair to look poofed up and frizzy. 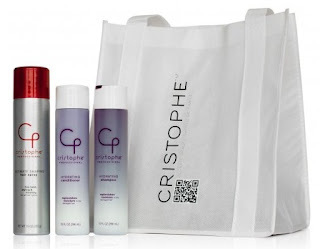 Cristophe Professional's Hydrating Shampoo and Conditioner are filled with moisturizing, anti-static, and anti-frizz ingredients to help battle any damage to hair - from heat to cold, color treatments to heredity. They lock in nourishing moisture to seal and hydrate the cuticle. The products offer salon-quality hair care for the smart and savvy drugstore shopper. Cristophe Professional's products are always tested in the Cristophe Salons before launch. They are tested on Cristophe's clients - never on animals. That's confidence. The company wants real feedback on the products and their performance. The line was carried exclusively at CVS and salons for last nine years, and now they are branching out into additional drug stores across the country. With the list of retailers growing, these products will be even easier to find. The Hydrating Shampoo has a delightful, light, fruity scent that disappears after my shower (perfect!). It lathers well and cleans my hair without stripping. I think it's hydrating, as promised. The Hydrating Conditioner has the same delightful scent. Its packaging gave me pause. It's a nice, thick conditioner that doesn't require an excessive amount to detangle and condition my hair quickly. My beef with conditioners is that I usually run out of them long before the matching shampoo. That was not the case with this beauty. However, I couldn't get it out of the slit in the flip-up cap. No amount of shaking, squeezing, or prodding could force the conditioner out of its plastic bottle. To use it, I had to remove the cap and shake it hard (the hard shake when it wasn't full anymore) to dispense the conditioner. Rich can have its disadvantages. I must leave most conditioners on my hair for three minutes or so to detangle my hair after shampooing. This one works really quickly. I can remove it after working it thoroughly through my hair. In fact, if I leave it on too long, my hair is very soft, but loses volume. That's because my hair is so fine. Those who have thicker hair (blonde hair is generally very thin) will find that it does a remarkable job of conditioning. I'd recommend you give this set a try. The price is right, and it's easy to find. Why pay a lot when a great drugstore product is right up the street? If you can't find it, you can order from Cristophe's Web site, where you will find hair care in all types, including glossing, volumizing, and color-extending. I guess we'll make it an IT day! Over the holidays, IT Cosmetics sent me a beautiful silver box with three Airbrush Blush Stains ($39.50). I've been enjoying them since. This set of three gorgeous loose powder blushes is housed in a beautiful gift box, complete with ribbon, bow, and a gift tag that reads, "Because of You...The World Is More Beautiful!” How can you beat that compliment? 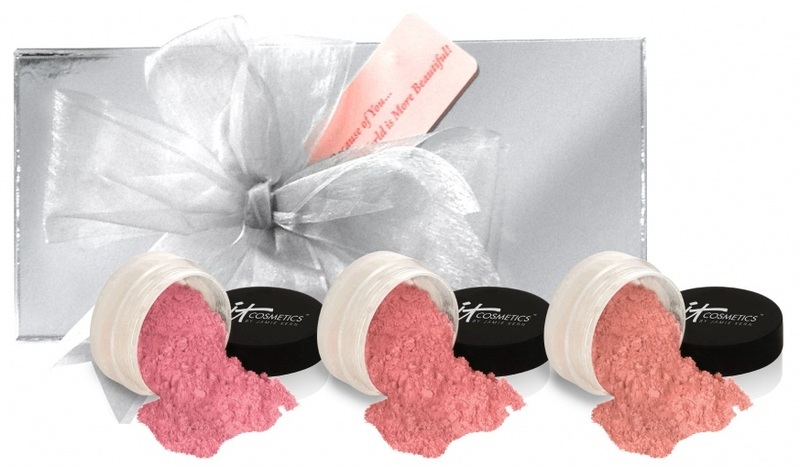 Anti-aging Airbrush Blush Stain is an airbrush silk cheek stain that's infused into a powder. The set includes these three shades. I photographed them in the following order, left to right. I took swatch photos in full sun. For the life of me, I can't remember how I applied them for the photos. I probably used a sponge-tipped applicator. Love Story is shown at the top of my arm. It's my favorite of the shades. While The sun added extra shine to my arm, the shade has its own vitality. I think Love Story is worth the entire price of the set. Rose Glow is a beautiful, natural rose that leans cool on my skin - another beautiful shade. Sweet Cheeks will be perfect for someone with warmer skin than mine or a tan. It's matte, which isn't my favorite finish, so I mix it with one of the other shades and bingo! It works beautifully. That's the beauty of loose powders. Just shake a little bit onto a mirror or other flat surface and pick up the pigment with a good brush. IT's brushes are fabulous. 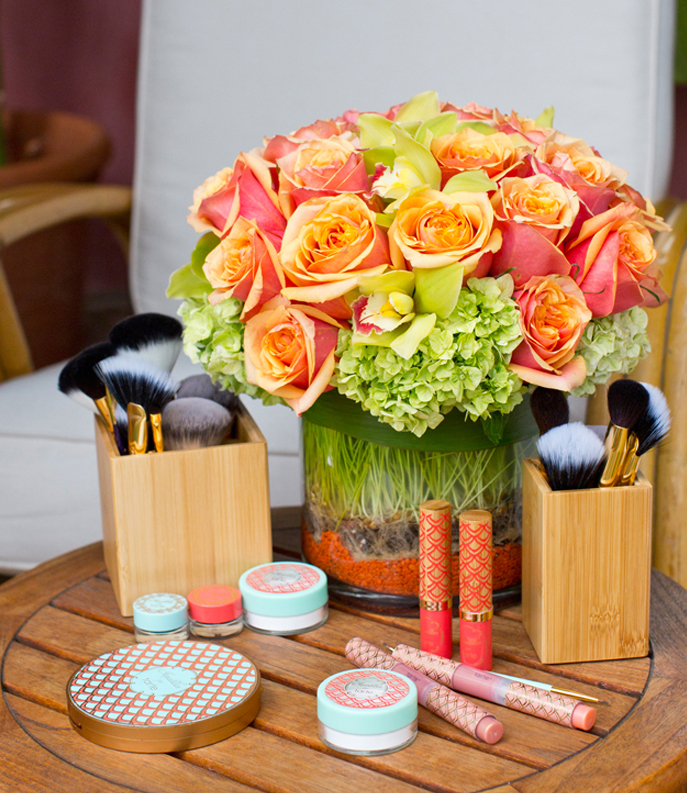 They suggest you use the Luxe French Boutique Blush Brush, which is sold separately). Their tips for application? Lightly dust blush over the apples of your cheeks using light, upward sweeping motions. Just the lightest touch of this blush provides a gorgeous flush of color! For more intense color, apply a second dusting of blush. 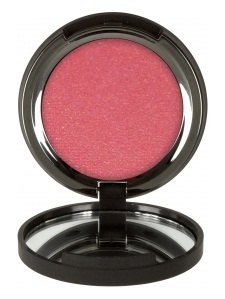 This blush can be used on bare skin or over foundation. I've enjoyed everything IT Cosmetics has sent me. I have more to show you - if the sun will ever shine for an entire day. 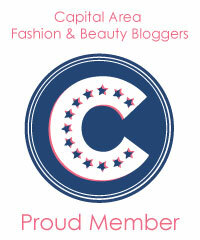 You can find IT at QVC (where I don't hang out often), Henri Bendel, and Beauty.com, and the company's Web site. In Canada, you can order from The Shopping Chanel, and in Australia, you can order from PM Studio. Look around online and let us know what grabs your attention. Last fall, I discovered a new-to-me brand: IT Cosmetics. IT knocked me off my feet. I featured Vitality Cheek Stain in Pretty in Peony and expressed my wish to try Radiant in Rose. IT sent me Radiant in Rose, making my wish come true. I knew I'd love Vitality Cheek Stain in Radiant in Rose ($24), and I do. Let's start with the color. It's much prettier in person than it looks on the IT site (see photo at the top of this feature). The color is pure rose, and a perfect pick-me-up for spring and summer. It's a powder blush, cheek stain, antioxidant defender, and hydrating skin conditioner all in one. The cutting-edge micro-milled, long-wear powder stain never clings to fine lines and wrinkles, but it imparts the glow of a stain with a powder. In the compact, if feels like a hybrid between a cream and a powder. Pretty cool! Developed with plastic surgeons, this hydrating, brightening, and anti-aging blush gives the perfect naturally pretty flush of color to the cheeks and is surprisingly long-lasting. The innovative formula contains IT Cosmetics' Hydra-Luxe technology, including ingredients such as plum oil, cherry oil, hyaluronic acid, pomegranate, seaweed extract, grape seed, aloe, and jojoba that all work together to treat, hydrate, condition, and nourish your skin. Plus, Vitality Cheek Flush is packed with antioxidants, including vitamins A, C, and E, açaí fruit, green tea, and white tea. They packed all those fabulous ingredients into one blush. What did they leave out? Talc, paraben, sulfate, mineral oil, petrolatum, synthetic fragrance, and phthalates, making Vitality Cheek Stain a blush for everyone. An extra-added benefit is that is is made in the USA and cruelty-free. I know we have all been trying to avoid phthalates, but after seeing Dateline on NBC News Sunday night, I must write about what I learned. I don't want them or any other hormone disruptors metabolized in my body. More on that another time. All of you who have a hard time holding onto your blush for an eight-hour day will love Vitality Cheek Stain. It is seriously long-lasting (as are some other It products I've been trying), and it may be the answer to an issue that has vexed you as long as I've been writing this blog - or longer. This cheek color will stay with you all day. I took swatch photos in full sun that was fading fast. I applied the swatch of Radiant in Rose at the top of my arm with a sponge-tipped applicator, and a larger swatch with a blush brush below - both fairly heavily. Fortunately, I got a few photos before the clouds diminished the light. The color is pure rose. It is the pink of spring. With Easter coming up, we will see a parade of spring colors. Radiant in Rose will fit right in. I have one more of these gorgeous IT Cosmetics blushes to show you: Magical in Mauve. I'm a fan! Last fall, I admitted that I've had my head in the sand. Perhaps I'm too much of a luxury brand snob. Look at this page of stories and wonder (along with me) how I had only a passing knowledge of IT Cosmetics before autumn. I'm almost ashamed to admit that my first try of It Cosmetics was in October. Want to know a little more about IT? Check out this About page on the company's Web site. I'm joining this family. Who doesn't like anti-aging makeup with flair? You can find IT at QVC (where I don't hang out often), Henri Bendel, and Beauty.com, and the company's Web site. In Canada, you can order from The Shopping Chanel, and in Australia, you can order from PM Studio. Look around online and let us know what rocks you. Thanks to IT, I have a lot more to show you. As the sun rises in the sky and spring arrives for good, I'll have more available time for swatch photos. 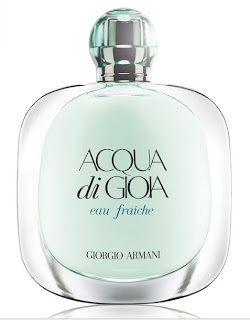 Giorgio Armani Parfums has introduced a new fragrance: Acqua di Gioia Eau Fraîche ($58-75). I received a press sample, and I love it! Like everything Armani touches, it's elegant and sophisticated. Now is the perfect time to investigate. 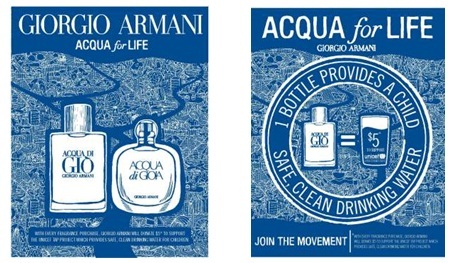 During March, Giorgio Armani Parfums is donating $5 from every purchase of this new fragrance, as well as Acqua di Gioia, Acqua di Giò, and Acqua di Giò Essenza, to UNICEF's Tap Project to provide clean water to children who would live without it - if it weren't for this charitable movement. An exclusive infusion of just-picked flowers offers a new experience of natural and radiant femininity. This fresh, refined, and tender interpretation of Acqua di Gioia can be described as precious, transparent, and delicate - much like Armani's top-of-the-line clothing. The top notes burst to reveal grapefruit, ylang-ylang, and cedarwood. The middle notes develop to include mandarin, water jasmine, and a brown sugar accord. Lastly, the base notes passionately envelop the skin to lay forth bright primofiore lemon, a whisper of jasmine accord, and a hint of soft musk. The delicate balance and harmony of notes is both delicious and divine. 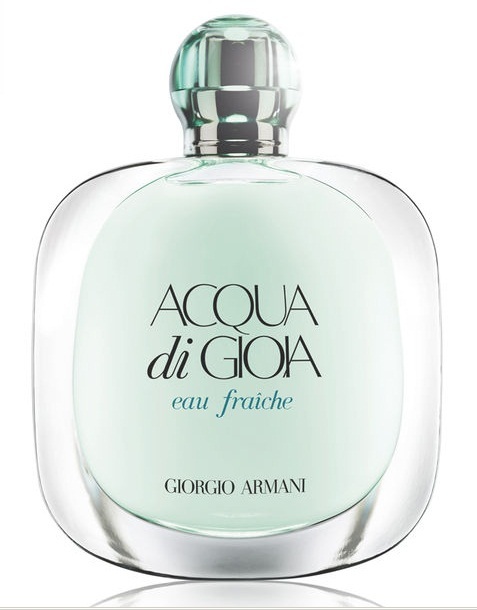 Acqua di Gioia Eau Fraîche is fresher and lighter than the original Acqua di Gioia fragrance that was introduced in 2010. Armani compares it to a delicate breeze, gentle shower of water, and soft green leaves. Compared to the original, the aquatic notes are more pronounced, and the florals subdued, yielding a floral fragrance that you will find refreshing, light (but with staying power), and perfect for the warm months. I'd call the sillage moderate. The bottle, with its shades of light green, is smooth and graceful in the hand. Perhaps its due to Mr. Armani's home in Italy, but Acqua di Gioia Eau Fraîche tells me a story. I'm staying in a delightful seaside hotel. I've had a full day of shopping for treasures one can only find in Italy. 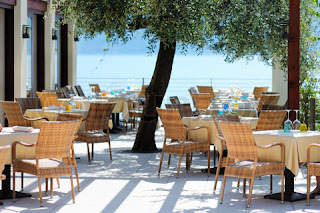 In the late afternoon, I return to the hotel and sit by the sea with my companion, drinking prosecco and munching on crusty bread. The smell of the garden and the sea mingle to delight my senses, leaving me with a relaxing, fresh, scent of paradise. I have no cares and can enjoy the moment. Life doesn't get better. That's the scent of Acqua di Gioia Eau Fraîche. You can find Acqua di Gioia Eau Fraîche at Giorgio Armani Beauty counters, boutiques, and, of course online at the Web site. Please remember that your purchase alone will support Armani's Acqua for Life program, in turn allowing UNICEF to provide one child with safe drinking water for 200 days. Giorgio Armani Parfums has donated over $1.3 million to support UNICEF's Tap Project. The children of the world deserve to enjoy the clean water we take for granted. Tarte's new, limited-edition Aqualillies Collection for Summer 2013 was inspired by America's most glamorous synchronized swimming group, the Aqualillies. I think that's really cool. In my high school and college days, I practiced synchronized swimming - over and over and over again, holding my breath as I executed the hardest and longest moves with my team. I love the recognition Tarte is giving the sport. The seven splash-proof products in the collection appear to be right on trend - from aquas to pinks and peach-corals. Just click on the photo above to enlarge it and get a better look. You can get a sneak peek of the collection today at Tarte.com (watch the video at http://www.youtube.com/watch?v=5ATLAKrwRDU&feature=youtu.be). Otherwise, you'll have to wait until April to see it at Tarte retailers. There's one thing about Bobbi Brown's Lilac Rose Collection I think we can all appreciate - no matter what our color preferences may be. The promotional photograph is gorgeous! I love flowers, and I would have days of bliss if this arrangement were in my living room. I had an opportunity last month to feature the divine Lilac Rose Shimmer Brick. At the time, I wasn't able to get swatch photos of the Lilac Rose Eye Palette ($60). Finally, I have a few to show you! Fresh from the runway, Bobbi has paired heather grey with pops of bright pinks and purples in the Lilac Rose Collection, creating her own twist on this season's prettiest trends. A modern take on spring florals, this mirrored compact features eight mix-and-match eye shadows in the season's most-wanted looks: heathery neutrals and dusty pinks designed to flatter all skin tones. The palette includes a range of textures, from Shimmer Wash to Metallic shades, for buildable color that blooms beautifully. With a deep charcoal shade that doubles up as an eyeliner too, this floral-inspired palette is our freshest pick for eyes. 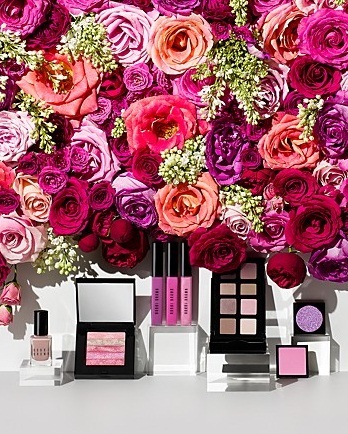 With an overabundance of Bobbi Brown Palettes staring at my from my various storage locations and a strong desire for Bobbi to introduce far more single eye shadows, why did I purchase the Lilac Rose Eye Palette? Because it's filled with beautiful taupe shades, along with complementary shades that, for the most part, I can wear. 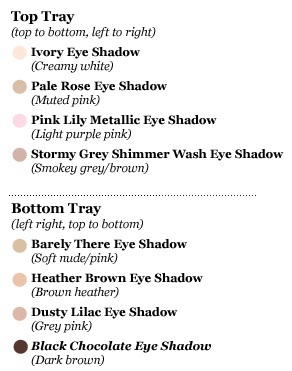 Here is Bobbi Brown's shade chart. I took swatch photos in full sun, applying each shade with a sponge-tipped applicator. I swatched each tier - or pull-out drawer - in clockwise order, starting at the top of my arm. I didn't spend much time trying to photograph the ubiquitous Ivory Eye Shadow. It barely shows on my pale arm. You might see Ivory peeking out above Pale Rose Eye Shadow at the top of my arm. Pale Rose is a matte, very muted/greyed pink. Stormy Grey Shimmer Wash Eye Shadow is the winner of the top tier. It's a beautiful, saturated taupe. Love it! The icy pink at the bottom of my arm is Pink Lily Metallic Eye Shadow. While I was out snapping photos, I started to lose my sun. Nevertheless, I saw the star magnolia bud, pretty in pink, trying to break free of its sheath. I took the photo above. to show the bottom tier shades. There's a sunnier photo below. Eye Shadow below is a gorgeous, lively taupe shade. These two shades are my favorites in the Lilac Rose Palette. Black Chocolate Eye Shadow was a good choice for the palette, with all the taupe and pink colors. It is dark enough to define the eyes, but doesn't have the edge of black. I don't really care for Dusty Lilac Eye Shadow at the bottom of my arm directly above. It's the kind of shade that makes me look tired and my eyes red. For a short behind-the-scenes look at Bobbi in action as she takes us through her new Lilac Rose Collection, click on this YouTube link. The Lilac Rose Collection is a available at Bobbi Brown counters and Bobbi Brown's Web site.